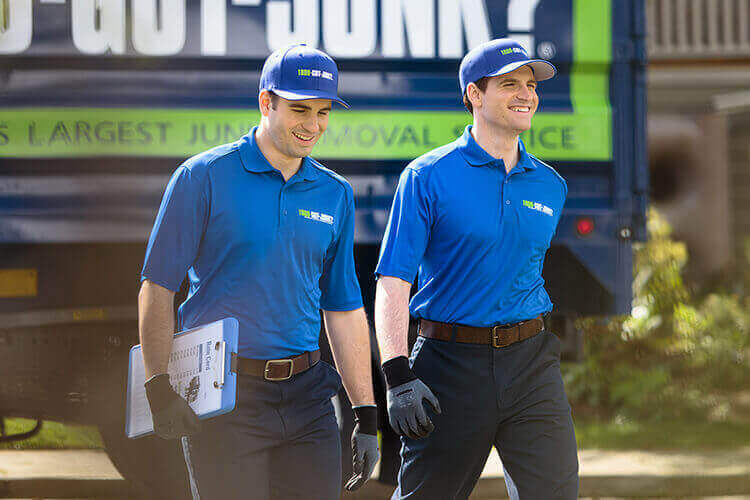 Pre & Post Moving Rubbish Removal | 1800-GOT-JUNK? When you’re faced with having to clean out an entire house, the task can seem a bit overwhelming. At 1800-GOT-JUNK?, our goal is to make rubbish removal easy for you. We’re experts in home cleanouts and can get the job done quickly and efficiently. 1800-GOT-JUNK? offers rubbish removal service you can rely on. Our teams are professionals who understand that dealing with house cleanouts can be stressful. They’ll work hard to everything cleared out as quickly as possible, so you can get back to normal. We also understand the need for quick resolution with house cleanouts, which is why we always show up on time. Our team will quickly provide you with an on-site estimate after taking a look at the scope of the job. We price based on the volume of space your rubbish takes up in the truck, so you’ll never pay more than you should. During the difficult and sensitive time when one has to proceed with an estate cleanout, you want a company that will be punctual, patient, and respectful while treating you with care. Whenever possible, we will donate as many items as we can to a charity or goodwill. Moving can be stressful. But if you plan ahead, you can make the whole process easier on yourself. It all starts before you even start actually packing up your home. When you’re getting ready to pack, set aside any items you don’t really use. It just doesn’t make sense to pack and move things you’re never going to use again. Just before your move, book rubbish removal with 1800-GOT-JUNK?. We’ll help you get rid of all your unwanted rubbish so you only need to pack the things you actually want to keep. We even offer same day removal for those last minute rubbish discoveries. If you’re upgrading to some new furniture or appliances, you might be wondering what you’re supposed to do with the old stuff. Getting rid of it on your own is possible, but can be tricky to organize, since you’ll need access to a truck and an extra set of hands. 1800-GOT-JUNK? makes the process of getting rid of your old furniture or appliances so much easier. We’ll pick up the items right from where they’re located and load them into our truck. You won’t have to do any of the heavy lifting—just point and rubbish disappears.